In May of this year, my husband and I were browsing the Petfinder.com site after our beloved “Enzo”, a beautiful Husky/Shepherd mix crossed the Rainbow Bridge. Enzo was such an important part of our family for almost 15 years and we were so lost without him. We happened to see a precious photo of “Rex” and “Roxy”, a truly bonded brother and sister. After looking at so many photos and write-ups of beautiful German Shepherds, we were continually drawn to this pair. Shepherds have a way of looking so deep into your soul with their eyes, more so than any other breed we’ve ever known. Rex and Roxy are a 3 year old brother and sister who were in foster care through the Echo Dog Rescue Group. They were looking for their forever home and we were fortunate enough to be their choice, traveling through a 6 leg transport team all the way from Dover, Ohio to Hamilton, New Jersey over the Memorial Day Weekend. Rex, our “White Knight” is a care-free lover of life who seizes every moment. Roxy, our “Sable Queen” is a gentle soul who carefully watches over her brother. The special relationship that these two share has been revealed in so many unspoken ways. We are amazed each and every day at the way Rex and Roxy give their love so naturally, without ever expecting anything in return. filled with warmth, love and patience, and we have always made the unconditional commitment to open our hearts and do whatever it takes to keep our pets happy, healthy and loved. We could never imagine not sharing our lives with furry loved ones right by our sides. After all, their never ending gratitude and wagging tails are all we could ever ask for. It is both an honor and a privilege for us to always make them feel loved and respected. They deserve nothing less. We are pleased to share with you one of our favorite photos we recently took of our Rex and Roxy. Enjoy! Thanks so much for sharing your wonderful story with us. Rescuing dogs is a wonderful thing that I wish more people were doing but to rescue a pair at one time, now that's true committment! Bless your hearts for giving “Rex” and “Roxy” a forever home. You are to be commended for that & I truly applaud your work as new German Shepherd owners. Thanks so much for what you've done. One thing I can be sure of - “Rex” and “Roxy” will forever be in your debt and they will undoubtedly provide you with nothing but love for the rest of their lives. Please keep us up on how they're doing. Congratulations on your new kids! What wonderful people you both are for taking in brother and sister; to keep them together in a loving home, not to mention the trip to take to get them. I applaud you both!!! Rex and Roxy you have double the fun and protection from these beautiful Shepherds. It was a long road behind them and now they are at the destination, "a loving home and people who truly appreciates them". Take care of your Beautiful Rex and Roxy and they will protect you both forever! God Bless. Welcome to NJ! I am so proud of both of you! You were very brave to travel from Ohio to NJ!! Let me assure you (as you know) that your trip was worth every second on the way. The Bologninis are the best people I have ever known in NJ. They are kind, caring and responsible people. My dog (Charlie the Bullmastiff), cats (Suzie, Samantha, and Peanut) and I all love them. When I learned that both of you joined the Bolognini family, I was so excited. Both of you brought back the memory of my late GSD Princess Margaret A.K.A Maggie. She was my sweet and gorgeous girl for 12 years, and still is. You will have a great time with Doreen and Nate forever! All my life I have rescued German Shepherd Dogs, but the breed of dog is not what is important here because to rescue any dog, cat or any animal explains who we are as compassionate human beings. I really believe this is God's test to care for his living species here on Earth. It's nice to know that as I get older now that I have no fear to care for a needy German Shepherd because there are people like yourself that will care for my GSD's in the event I too cross the Rainbow Bridge to be with my beloved GSD's that have already crossed. It's people like you that make life on this Earth have meaning. 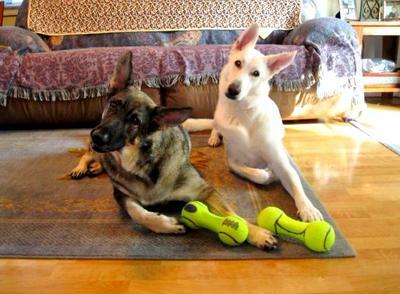 It's GSD's like Rex and Roxy that ease the pain of your loss. Thank you for what you do because of you Rex and Roxy will brighten your day and the world around all of us.